The nightmare from an old painting, Crepuscule Monstrum, requires sacrifice. Merrick has been chosen. For what, he knows not, but he’s terrified until the monster–laughs. Is he Merrick or Michael? 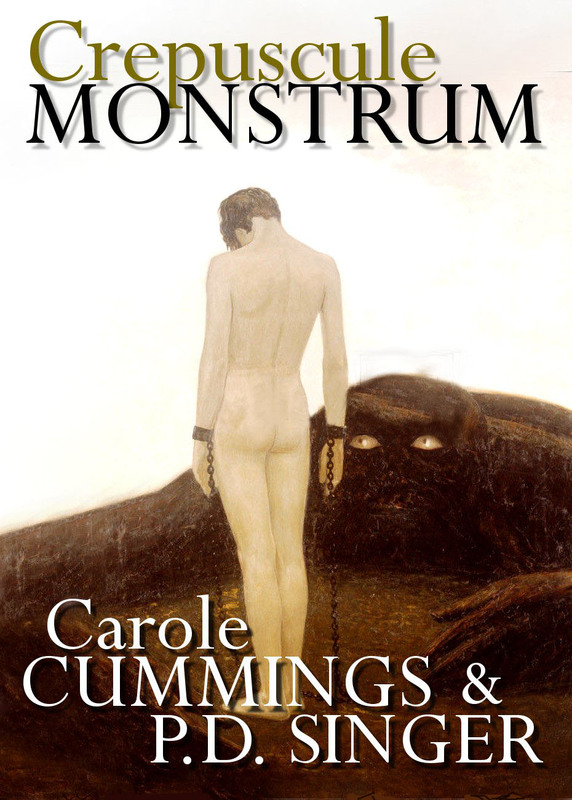 Is Jake really Jake, or is he Crepuscule Monstrum? And is it really so awful to touch this “horrible creature”? Carole Cummings and I wrote a short to a picture prompt at Cryselle’s Bookshelf–an accidental collaboration as it turned out. The first part is still there at Cryselle’s review blog, but the second part is hard come by, until now. Carole ended her section on a cliffie, with a challenge to any author who might want to finish it. I can’t leave something like that alone. Crepuscule Monstrum Parts 1 and 2 were briefly available through Dreamspinner for the Halloween festivities, but haven’t been seen again until now. With a cover from Jared Rackler and formatting by the staff of Rocky Ridge Press (me), we now have a unified story to offer. Carole and I will send you your choice of PDF, ePUB, or mobi file in exchange for following us on Twitter, or if you prefer, here on the blog. Because Crys started this with her prompt pic, following her will net you a copy. Heck, follow us all, we don’t tweet much. This entry was posted in Free read and tagged Free read, Twitter. Bookmark the permalink. Hi! I’d love a Mobi copy at katherinehalle at yahoo dot com. Thank you! I’d love an ePub at anzuazura at yahoo dot com. Thanky you! I’d love an epub copy! Erm. I think you know my email address. 😉 And I’m notoriously twitter-free. 😀 Thank you!! !